Italian fascism came to power (and solidified power) by co-opting existing political organizations and interests in Italy. That included the Catholic Church. 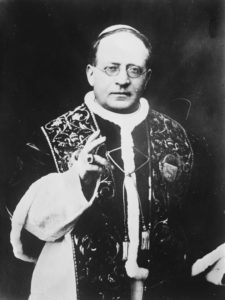 Since Italian Unification the Church had been at odds with liberal Italy, and for fifty-nine years pope did not even set foot outside the Vatican. In 1929, though Mussolini offered the papacy a way out, with the creation of Vatican City as an independent state. Unfortunately, this would not go entirely well for the church. Fascism is the most malignant of the major political ideologies, and one of the least understood. For fascism, the nation (and therefore state) are paramount. Considerations for the needs of social classes or individuals are subordinate to the state, if they are considered at all. While Germany is easily the most famous fascist state, this ideology had its origins in Italy following WWI. 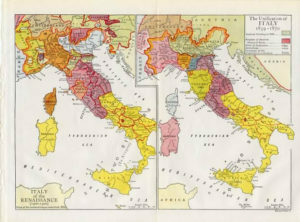 Prior to 1870 the term “Italy” was a geographic designation, referring to a collection of kingdoms, city-states, and papal states that happened to share a boot-shaped peninsula. Curiously, this collection of disparate elements would form not only a national identity, but a particularly violent, extreme one. One that would form the basis of probably the most destructive ideology of the past one hundred years. You’ve probably heard to Atlantis, but that’s not the hypothetical lost continent out there. There’s a whole subgenre of supposed submerged continents, with Atlantis being only the most prominent example. Other mythical lands include Mu and Lemuria. Anymore, Lemuria is now associated with new age pseudohistory, but as an idea it was first posited by an actual scientist. In 1864 Philip Sclater was trying to puzzle out why there were lemurs in both Madagascar and India, but not in Africa or the Middle East. If the animals had migrated from one of those regions to the next, then it stood to reason that there would also be lemur populations between them. To solve this problem, Sclater proposed that there was once a large mass of land in the India Ocean he called “Lemuria” that would have allowed lemurs (and, presumably, other fauna) to migrate from India to Madagascar and back again. 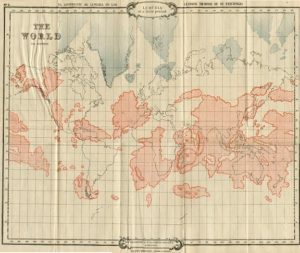 Sclater’s idea was eventually rendered obsolete by plate tectonics, but the idea of a lost continent was seized upon by occultists such as Helena Blavatsky. Charlatans such as Blavatsky claimed to have received special knowledge of humanity’s origin from the lost continent, and a whole subgenre of fake history was born. The religious state persisted for approximately a decade and a half but after that the British, eager to solidify their influence and control in the region, brought the country to heel. Egypt had never recognized Sudanese independence, and thought of the new country as little more than a renegade province. 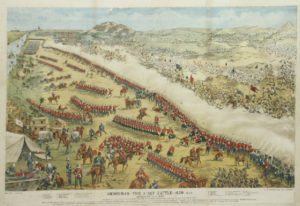 Under British control and influence, the Anglo-Egyptian forces crushed the independent Sudanese state, making short work of the armed forces. The key to their victory was a new technology: The machine gun. 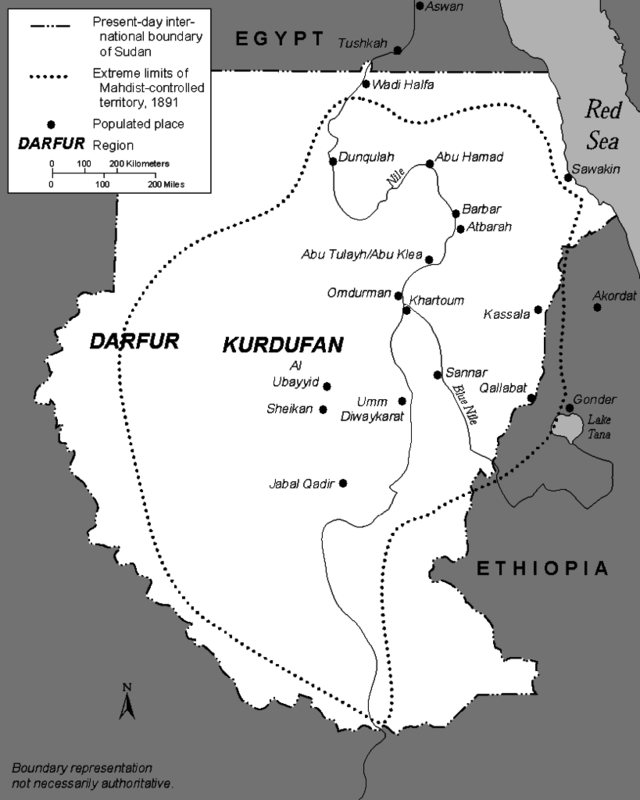 After the British victory the military and cultural foundations of the Mahdist state were destroyed, and Sudan was soon in the same state of repression that it had previously been in, though instead of dealing with the Ottoman boot, now it suffered under the British. After successfully defeating the Ottoman-Egyptian and British forces at Khartoum, Sudan formed an independent government based around Muhammad Ahmad, the self-proclaimed Mahdi or “expected one.” Unfortunately for Sudan, though, Ahmad died of Typhus only six months after the birth of the new state, and Mahdist Sudan was almost immediately faced with a succession crisis. It would only be the first of many trials for the new state. Regional rebellions and border skirmishes, a war with neighboring Ethiopia, and economic isolation and famine would all take their toll on Sudan, and over the lifetime of the Mahdist state, millions of Sudanese citizens would die as a result of violence and privation. In the early 1880s Sudan suffered under the heel of the Ottoman empire. 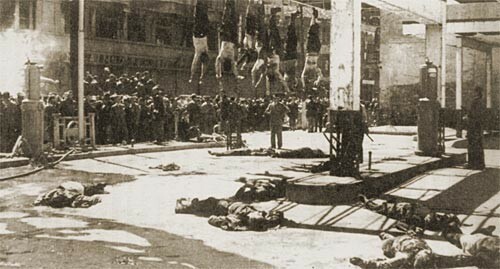 Military occupation and heavy taxes led to widespread discontent that eventually led to a religiously-infused rebellion. Muhammad Ahmad styled himself as the Mahdi or “expected one,” a prophesized Islamic figure, and drawing on discontent, Ahmad led a rebellion throughout the country. 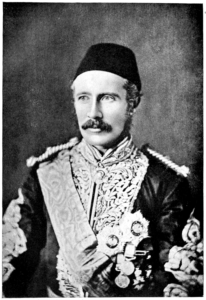 The British officer Charles George Gordon (pictured below) was put in charge of evacuating Egyptians and other foreigners from the Sudan. But, because of his poor relations with the British and the Ottoman-Egyptian governments, Gordon ended up holed up in Khartoum, under siege by the rebel forces, and eventually dead at the hands of the Sudanese. The Mahdi had successfully defeated the foreign occupiers, and a new state formed under his religiously-inspired revolutionary power. The British Empire and other colonial powers did a lot of things wrong, and they famously ignored actual human patterns when drawing borders of Africa. In 1899, the British drew a border between Egypt and Sudan that simply ran in a straight line across the 22nd parallel, ignoring how people in the area moved and identified. A few years later, in 1902, they corrected their mistake and re-drew the boundary. The result has led to a border dispute between Egypt and Sudan where Egypt claims the 1899 border, and Sudan the 1902 border. This dispute means that a small patch of desert, Bir Tawil, is not claimed by either nation. In 2014 a man from the United States attempted to claim the land and declare it to be the Kingdom of North Sudan. Why? So his daughter could be a princess, of course. 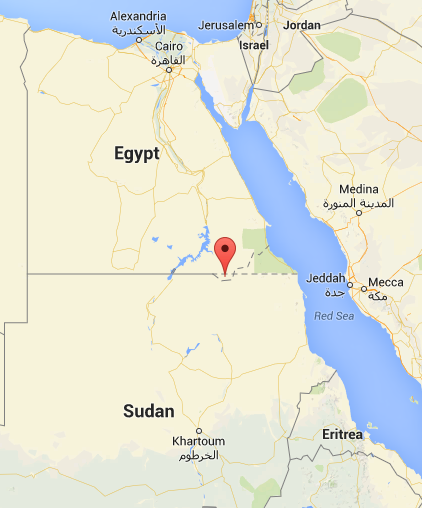 The image below shows Bir Tawil on Google Maps, with the pin in its location. Next to it is the Hala’ib Triangle, which both countries claim. Bir Tawil on Atlas Obscura. An opinion piece about Jerimiah Heaton and his micronation over at the the Independent. The author points out, with cause, how bad it looks for a white westerner to suddenly be claiming to own a chunk of Africa. A piece about Disney’s Princess of North Sudan on Deadline Hollywood. The official website for the Kingdom of North Sudan. In the late 1600s Scotland, in an attempt to start an international trade empire, founded a small settlement in what is now modern Panama. 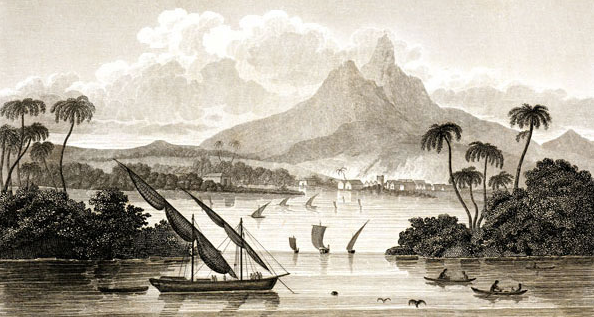 The venture was frustrated at every turn by the English, who did not want their northern neighbor competing on the international scene, and the Panamanian jungle proved to be an inhospitable environment. The settlers were plagued by starvation and malaria, and eventually the Scots were ousted by the Spanish. The dramatic failure of the colony led to the end of Scottish independence, and a few years later 1707 that country would permanently join with England. Had the colony succeeded, the map of Europe and Central America could look very different today, but as it is Scottish ambitions and independence vanished hundreds of years ago in the jungles of Central America. The BBC on the Darien Scheme. A look at the Darien Chest, the object that held the money and papers for the Darien Scheme. One settler’s account of this history of Darien. And then there are some states which just declare independence and call it good. Like Sealand, for example, an ostensible principality off the coast of Britain that has endured as one of the world’s most successful micronations. Sealand’s official website, where you can become a lord, lady, baron, or baroness, depending on your preferences. Sealand The Mystery Solved is a four-part YouTube series about the micronation. It was made in cooperation with the principality, so, in a way, it is official Sealand government propaganda. Of a sort. Fettes Brot, a German hip-hop group, shot the music video for their song Echo at (on? in? what is the proper preposition for a fort/micronation?) Sealand. Before and during World War II Japan (just like Britain, France, and the United States) had a considerable empire. The Greater East Asian Co-Prosperity Sphere encompassed the Korean peninsula, several Pacific Islands, and holdings in China. Probably the strangest part of the Japan’s empire was Manchukuo, an artificial country in northern China that Japan made by (among other things) bombing a train and kidnapping the former Chinese emperor. This 1937 pro-Japanese propaganda film presents a laughably glowing vision of Manchuria under Japanese control. Listen to Manchukuo’s national anthem! It sounds like lots of other national anthems. The New Imperialism and Post Colonial Development State: Manchukuo in Comparative Perspective is one of the better scholarly essays I read about this topic in preparation for this episode.